Our main configuration is five-piece, consisting of guitar, bass, keys, drums and lead vocals. We are happy to provide our own sound for events & venues with under 300 people, or contract a cost effective sound and lighting for you. Our flexibility and professionalism also allows us to readily work with your sound and lighting contractor. We can supply a detailed technical sheet for corporate events making the preparation of sound gear very easy. Staging requirements are kept simple. We can readily work in a space of 16 feet Wide by 12 feet deep. We are also able to complement live entertainment with CD selections for ambience and seamless listening between sets. Cece Pastor and Word of Mouth have teamed up with DJ's, Opera stars, Orchestras, Dancers, Gymnasts and Magicians to bring the flexibilty and extra effort required to make events outstanding. Preparation, reliability and professionalism have earned us our reputation. A great band can be the difference between a good event and a great event. Cece makes events spectacular! She draws on a huge scope of material to satisfy every musical taste and together with her band, just keeps going and going and going. When the National Event Planners Association held their annual schmooze-fest, it was Cece and the band they called on. Her band, "Word of Mouth" features keys, bass, guitar and drums. 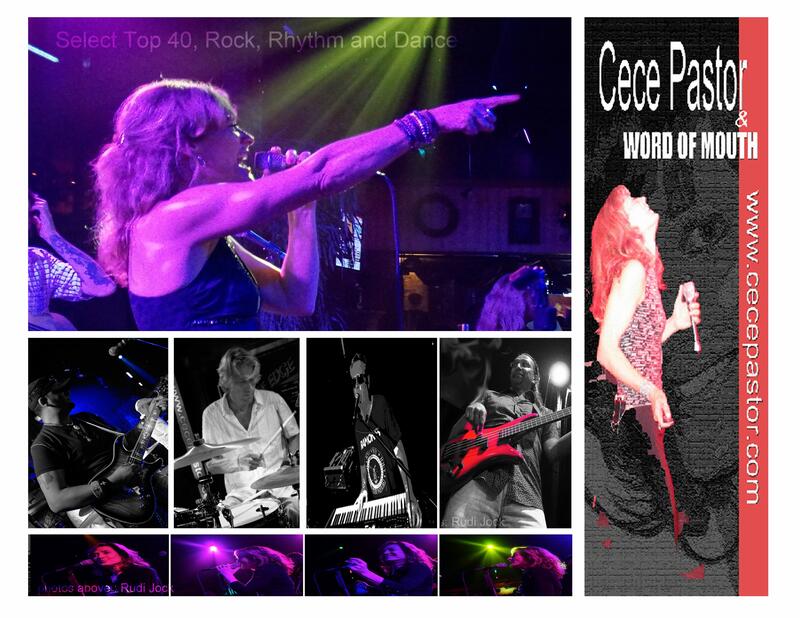 These four musicians have worked with Cece exclusively for a decade + and bring to the stage combination of touring experience, live stage as well as club and corporate experience. It's a total package. Our list of corporate clients is extensive, which means we understand more than just entertainment, we help make events smooth and seamless for our clients. Club owners, and/or agents representing clubs, can contact us directly. We are happy to work with your representatives that book your room. By phone, you can contact Stephen McLaren @ (905) 471-3773 (voice mail 24hrs per day). Cece co-ordinates most club dates and your inquiries will be directed to her.